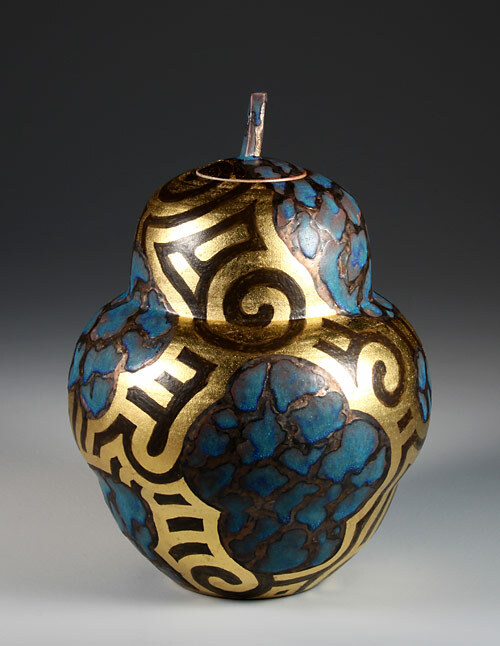 Gold leafing can add a new dimension to the surface enrichment of ceramics. I particularly like to use it as a contrast to the rugged nature of stoneware clay, or as a contrast with darker glazes for making patterns. In the early 1990s a jeweller friend of mine, Sandra Noble Goss taught me how to apply gold leaf to a surface. Sandy uses gold leaf as an accent or tonal change in her jewellery work, and I could see potential for its use with ceramics. As an art student I had used gold lustre on ceramics to emphasize various elements of the designs. Gold lustre is painted on to the works, and then the pieces are re-fired to bond the gold to the surface. 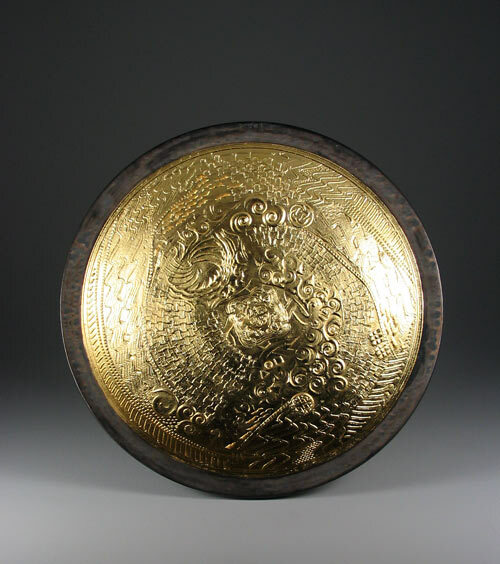 Gold leaf has a post firing application, and it has a different quality of appearance compared to gold lustre. To my eye, gold leaf has more of a radiant patina. I have a step by step section that shows how to apply gold leaf. Additional references would be a page on gold leafing I contributed for Robin Hopper's book, Making Marks, and an article I wrote for the Mar/Apr 2004 issue of Pottery Making Illustrated. 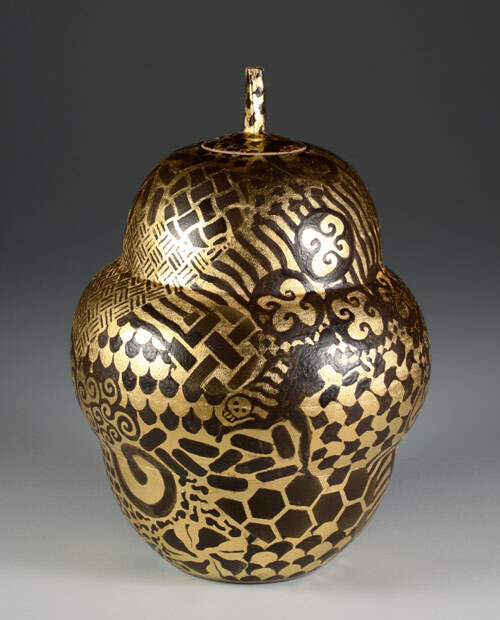 This stoneware jar has a surface of 24K gold leaf, and black glaze. It stands about 32 cm tall. I've had lifelong interests in pattern and complexity. Dynamic, non-linear processes are also a passion, and this jar is a response to those concerns. A bold surface that is in harmony with the form is the challenge. This wheel thrown stoneware jar stands about 34 cm tall. 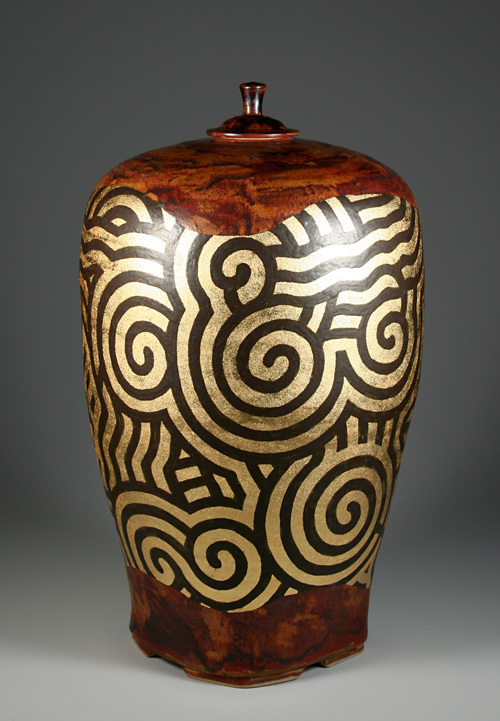 It was fired to cone ten reduction, and it has copper glazes on the outside, plus a black glaze convection pattern, and a post firing application of 23K gold leaf. This vase has a design inspired by convection patterns in liquids. I've been working on variations of this form for several years, both with vases and covered jars. It starts out as a 12 pound (5.4 kg) round pot, thrown without base. The lower section is then squared off into four or six corners. A base or floor for the pot is then added, and feet are attached at each corner. The pot then goes back on the wheel and a neck is made if it is a vase, or a measured opening is made if it is to have a lid. This vase is about 44 cm tall. There was a post firing application of 23K gold leaf. This pattern is inspired by Rayleigh-Benard convection patterns, which are often studied as models of chaos processes. 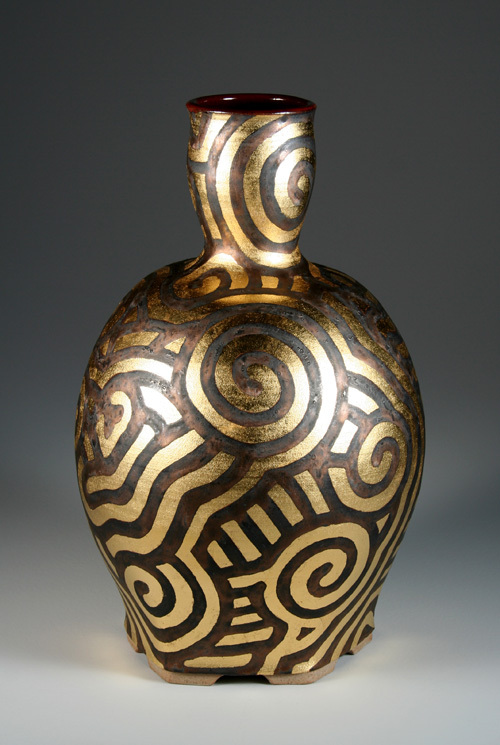 A large piece with the title, Spiral Convection Jar. It stands 55 cm tall and is about 31 cm wide. Both the making of the form, and the completion of the decoration were done in stages over the course of several weeks. From start to finish, it took about 100 hours to finish this piece. This jar is featured in the book, Contemporary Ceramics by Emmanuel Cooper. A double walled bowl, about 39 cm in diameter, with a textured interior. I used a variety of the stamps, roulettes, and texture tools from my studio to develop a varied surface on the interior of the bowl. After the firing to cone ten, multiple layers of 23K gold leaf were applied. 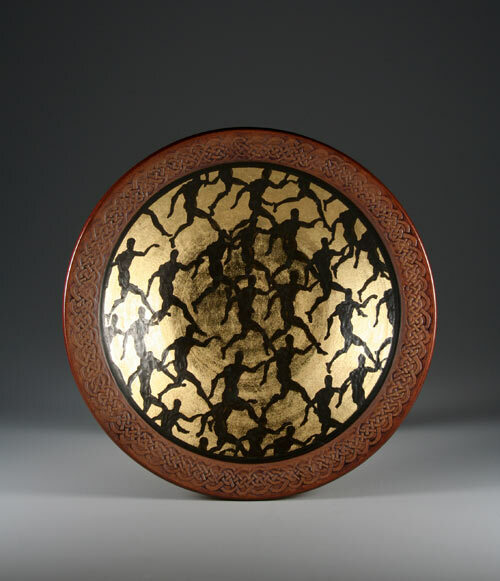 The stoneware Stride Platter is 40.6 cm in diameter, and It's decorated with black glaze and 23K gold leaf. I was interested in working with a repeating pattern to see the positive and negative shape relationships. The Celtic knot pattern on the rim has an iron oxide wash to emphasize the texture.